While such a natural solution sounds like a very good idea, none of the many experimental strategies performed to search for WIMPs has found convincing evidence for their existence. 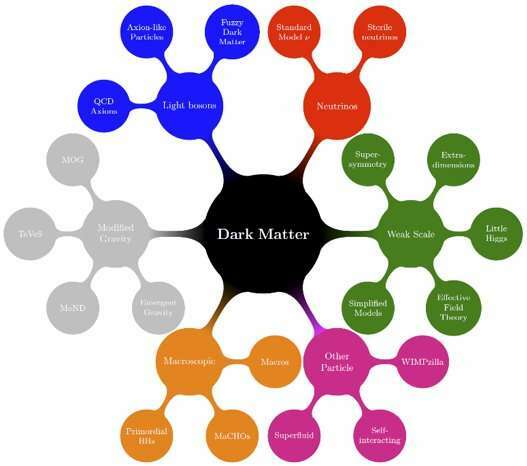 In their paper, Bertone and Tait argue that it is therefore time to enter a new era in the quest for dark matter – an era in which physicists broaden and diversify the experimental effort, leaving as they say "no stone left unturned". Well. I guess this proposal is as good a reason/excuse as any to increase funding and resources for Deep-Universe Astrophysics research. A new era and billions more dollars to hunt the snipe of the cosmos. The dark ages of science continues unabated. it is therefore time to enter a new era in the quest for dark matter – an era in which physicists broaden and diversify the experimental effort, leaving as they say "no stone left unturned". Create the Cavendish experiment with hydrogen instead of lead, and you will find a different value for G.
How is it phys.org can't get the network right? When maximally connected can't occur with electrons in sight. Light bosons, modified gravity, and superfluidity are not so different depending on the perspective. One's potential downselection, versus anothers maximally constrained, hints at operationally equivalence for reintegrating. Eddies of momentum without first fractures from perfect Higg's seeds and free parameters, sweeps the Friedman-walker-wilson models. The singular saved. The difference illusion. It is interesting to me that dark matter skeptics continue to push MTOG (modified theory of gravity) forward. I have yet to see any MOTG proposal that accurately and completely explains what we see out there. As a previous MTOG fan, I have moved completely away from it because of these flaws. I would love to see a consistent MTOG put forward that explains all of the observations, or an explanation of how these observations are incorrect, but until I do, dark matter by far is the best theory that explains everything. Cherry picking observations to fit MTOG proposals isn't scientifically valid or reasonable. Cherry picking? In galaxy mergers, dark matter doesn't interact with normal matter or other dark matter. Dark Matter is logically flawed, that's all I'm pushing. Recently two papers have been published. The first one deals with the measurement of the speed of rotation of galaxies and, in our view, closes the issue of the existence of dark matter. The second one argues that the expansion of the universe is not accelerating. However, this fact does not answer the question as to what in general is the cause of the universe's expansion and does not address the widespread opinion that 70% of the universe consists of dark energy. Recently two papers have been published. The first one deals with the measurement of the speed of rotation of galaxies and, in our view, closes the issue of the existence of dark matter. .....ok, you're off to a good start. There is no cause for "expansion" because there is none. In accordance with the 2nd Law of Thermodynamics, energy is distributed ONLY inside a closed & fixed boundary system, better known as ENTROPY. The motion of the Universe is that of a BARYCENTRIC system. Study the motion of star clusters, there is no single mass about which the other members of the system orbit, instead the motions of those star members are a classic center of mass better known as a BARYCENTER. and does not address the widespread opinion that 70% of the universe consists of dark energy. Dark Energy theory is a Pop-Cosmology debacle intended to supplant the immutable 2nd Law of Thermodynamics, ENTROPY. Dark Energy argues for an open boundary system by which the initial energy imparted to a particle somehow imparts eternal MOMENTUM to that particle. Then somehow the momentum of the particle is able to overcome any requirement of energy for motion beyond the first input of energy & supposedly travels forever without a gastank to supply more energy. Try that with a car, strip it's gastank away & see how much distance beyond that point it will travel before coming to a screeching halt, motions of galaxies are the same principle, stars provide the energy that results in the kinetic energy that put galaxies in motion. Pop-Cosmology Dark Energy argues for an open under which ENTROPY will quickly drop to zero thus ceasing all motion. Rewritten: Pop-Cosmology Dark Energy argues for an open unbounded system under which ENTROPY will quickly drop to zero thus ceasing all motion. In Parsec's comment above yours, he says that: "I have yet to see any MOTG (modified theory of gravity) proposal that accurately and completely explains what we see out there." What we see out there is - - -no Dark Matter and no Dark Energy. And THAT is the reality of it. The 80% missing Mass has already been located in the Early Universe in the form of HYDROGEN GAS. Hydrogen is Matter in the form of gas. And it is highly probable that the Hydrogen that existed in the early Universe is either still within that early location, OR it has since moved along and was the origin of many Star clusters within many galaxies. And if those Stars no longer exist, then the gas has moved on yet again - making even newer Star clusters and galaxies. No need for Dark anything, just common sense. Actually they are just plain FAKE. The shameless science denying nuts are attracted to DM like flies to a turd. That alone proves DM must exist and exert some type of attractive force. So many lucrative careers have been built on the search for dark matter, that the continued failure to find a single particle of dark matter is simply unacceptable. More money and time will continue to be spent on the chase for magic matter because it is too painful emotionally and financially for those who have spent their whole lives in this fruitless search to quit. I totally agree with cantdrive85 and rrwillsj. This is more modern physics....dreaming up things that don't exist. "Dark matter is a supersolid that fills 'empty' space,.... ". Like the space between the ears of people that believe this stuff. What is "shameless" is your advocacy for the advancement of Perpetual Motion which is all that Dark Matter Dark Energy, & Black Holes are all about. that is so popular with Pop-Cosmology. It isn't hard to miss your mindset what with all the profanity laced & foul mouthed rantings you identify so closely with in this chatroom, such as jonesy, schneibo, imp9, and of course yourself. Why do you guys write with so much cursing & profanity? The ENTIRE Pop-Cosmology crowd in this chatroom lace every sentence they write with foul mouthed ranting & you 5 Star it everytime giving witness to what Pop-Cosmology is really all about, it's as PERPETUAL as the perpetual motion funny farm science you believe in. The ONLY evidence for DM is gravity, and gravity is non-existant and based on an effect of expansion. Dark splatter is a supersemisolid that fills 'the empty space between my ears, strongly interacting with ordained matter and is displaced by common sense. What is referred to geomiraculessly as curvalicious sexyspacetime existing in nature as the state of hyperexcitment at my own fantasies. The state of displacement of reality with the supersemisolid dark splatterr is gravyity. The supersemisolid dark splatter misplaced by a galaxy gushes back, causing the stars in my outer arms to orbit my ego-centeroid at a fantastical rate in which they do. Misplaced supersemisolid dark spatter is curvalicious sexyspacetime. I see stumpo is back in town. Ignore the creep. Yes, I noticed that. Old Captain Prove-It-To-Me Prove-It-To-Me has come calling. And you know this - how? And I ask you again, Captain Chickenshit - And you know this - how? ...witness to what Pop-Cosmology is really all about, it's as PERPETUAL as the perpetual motion funny farm science you believe in. Your perpetual motion obsession once again illustrates your ignorance of science. You only think there is perpetual motion because you don't get the basics. There is no perpetual motion. Repeat after me: "There is no perpetual motion"
BUT!!! There is a theory of perpetual motion, all the energy and matter came from nothing in the vacuum, as perpetual motion is by definition energy from nothing! Eristic. Blah blah blah. Eristic, qv. ...........yeah, then how come you keep saying it without stopping saying it? You, the closest contemporary example this chatroom observes about what you say you don't believe in, Perpetual Motion. Do you then deny there is INFINITE DENSITY at the singularity of a BH? Be careful how you respond, I've set up an entrapment for you here. But there is no perpetual motion, no perpetual motion, no perpetual motion and on it goes perpetually, one could almost say,,, perpetually! All $.000000001 per dollar of tax money? Wha is WRONG with your brain, Ojorf, Once again you have attributed something to Benni which he has been fighting against in Pop Cosmology for a very long time. Benni NEVER said that he believes in perpetual motion. Read what he said again. considering you didn't read it the first time I answered, and then lied about it the second time, why should I continue to answer this? But there is perpetual motion, regardless of your cosmology. Everything (stars and galaxies) is moving, and is not going to stop. dogbert: "So many lucrative careers have been built on the search for dark matter" How many? Who? Show us their tax returns. Oh, right. You pulled that 'dark matter' from your posterior. It sure is "going to stop". Entropy demands it. There is coming a day when the entropy of the Universe will reach what is called in the 2nd Law of Thermodynamics as UNITY, call it HEAT DEATH if you like, or it may return to ZERO if a hole gets punched into the boundary wall of the Universe. Of course if the Universe is set up on an endless recycling process neither one may occur, that is so long as nothing punches a hole into the boundary wall of the Universe. Do you realize that if you could accelerate almost to the speed of light that you could reach the point where the Big Bang supposedly started in just 30 Earth years. Yeah, TIME DILATION it's called. Wouldn't it be just like Stumpo or RNP or jonesy to want to take a hammer & chisel with them on just such an expedition to see if they couldn't take some whacks & crack that wall? "It sure is "going to stop". Entropy demands it." But that's just not true. There is NO FRICTION to stop stars or galaxies from moving at constant velocity. To begin with they don't move at constant velocity. The Universe is a BARYCENTER of orbital motion just as we observe all star clusters to be. There is constant Compton Photon Scatter Effect everywhere, lots of friction if you please, kinetic energy creating heat (WORK). All this heat being generated by Compton Scatter will eventually drive the entropy of the Universe to a value of 1 (UNITY)., then it's all over. How long it takes for the value of entropy to reach unity is really a matter of how big the Universe is, it does seem to be pretty big, but it's not infinite. The universe is infinite, no evidence to suggest it's finite. The only evidence is a lame big bang theory. It all depends how big your clock is to describe perpetual. It's constant enough, I never heard of data that we were slowing down. I'll look. "constant Compton Photon Scatter Effect everywhere, lots of friction if you please"
This is absurd, this is photons and electrons, not collisions with atoms of mass. You never answered my question regarding your statement. Provide the link to the forum in which you claim that you answered my question - or remain the chickenshit liar that you are. I see that you have drunk the Kool-Aid. Pity. There is no such thing as 'perpetual motion' that is never ending. A frictionless mechanism in motion will tend to stay in motion until it comes in contact with a particle, dust, or light quanta hitting it, even if negligible, or if it moves toward a Star or a planet with an atmosphere. On a planet with an atmosphere it will no longer be frictionless. It will slow down and finally stop due to the force of gravity and other factors. Stars do have a tendency to explode at the end of its 'life', so that its motion is halted in its tracks. Any planets that are orbiting a Star that is exploding as a supernova, will be kicked out and wind up elsewhere. Still no perpetual motion. And, terribly sorry to disappoint you, but the Universe is NOT infinite, I assure you. All of the Quantum Particles that make up your body will be recycled and go back to the Quantum Universe from whence they came. If it's made up of Matter, then it will be recycled. You were not meant to live forever, otherwise you would be immortal. Only the Soul is immortal. Accept it. You will not know when we will come for you as your human form falls away and you breathe your last. It will happen... do not worry"
Unity will not result in "Heat Death". There will be nothing left to provide Heat in the last days of the Universe. Once the flames of the last Stars have been extinguished or blown away in massive explosions, not even the heat from their remains will be enough to keep them hot enough to possibly reignite. The Universe will be locked in below freezing temperatures and it will remain so forever, OR until the Creator returns. Now I know that there are some folk who resent the presence of a Creator, but they will not need to worry about being brought back to life for a possible 'second chance'. I can tell you that with great confidence. LOL Captain Chickenshit doesn't know how to read. You made a statement that "I have seen far far far more evil than you have." And when I asked you, "And you know this....how? And you disappeared from that forum while I was waiting for your answer. So tell us, Chickenshit Captain, how DO you know that you have seen far far far more evil than I have? You demand valid evidence from others - and I demand the same from YOU. What evidence do you have??? I see by that 1 just given me that the Chickenshit Captain is still reading this forum - but is too scared to answer my question with validated evidence. Chickenshit Captain is a perfect name/description. And still refuses to provide the link where it claims to have given an answer to my question. What a chickenshit. LOL Captain Chickenshit still doesn't know how to read. You made a statement that "I have experienced far far far more evil than you have." So tell us, Chickenshit Captain, how DO you know that you have experienced far far far more evil than I have? LOL I went back to that forum and searched for Chickenshit's answer as evidence, and it wasn't there. Captain Chickenshit is a lying dirty old scumbag that continues to lie, saying that it gave me an answer when there was no answer to my question of how does it know. Then it runs away again. Captain Chickenshit continually ruins good forums where good discussions are happening between those interested in good science. Chickenshit roams through these forums seeking to find anybody who will be willing to give up their private information to it so that it may have some control over that commenter. For anyone who is concerned about their privacy, DO NOT give your private information to Captain Chickenshit or he will take eventual control over you as he has already taken control over many commenters. The universe is infinite, no evidence to suggest it's finite. ENTROPY is the EVIDENCE for a FINITE UNIVERSE. The 2nd Law of Thermodynamics is IMMUTABLE, energy cannot propagate in an unbounded space, but Pop-Cosmology & it's acolytes have never studied Thermodynamics, so how would they know this immutable fact? So tell me, what is YOUR EVIDENCE the Universe is INFINITE when ENTROPY screams loudly against it? It doesn't matter how you try to separate the transformative properties of mass & energy, all of it results in KINETIC ENERGY which does the WORK to move things around inside a closed boundary system. ......this will be the CONSEQUENCE of entropy reaching unity. Ever notice what happens to an internal combustion engine that reaches UNITY? It destroys itself, sometimes spectacularly or simply comes apart little by little, the Universe will one day do the same, that is unless electro-magnetic energy generated in stars finds that it can be EQUIVALENT in being PERFECTLY recycled back to mass preventing UNITY of entropy from being attained, but unless this process is absolutely perfect there is an end coming. We do know there are several means by which electro-magnetic energy can be transformed to mass, what we don't know is if this occurs at the same RATE as mass is transformed into EM energy, if it isn't there will be a heat death end, then as you suggest it very quickly goes cold to the point even TEMPERATURE doesn't exist. When you say that "several means by which electromagnetic energy can be transformed to Mass", surely you don't mean that EM energy can be transformed INTO mass. That cannot be done by any means now, but for the One who has that ability. Perhaps you were saying that EM energy can be IMPARTED to Mass? I may have misinterpreted your meaning - but the last time that Energy was transformed/transmuted into Matter/Mass was at the time that the first Matter was created in the beginning of the Universe. Even though Stars are able to transform particles into new Matter within its fiery furnace, it is still only working with existing particles to do the job of manufacturing metals, etc. And yes, at the very end of the life of the Universe - it is the Cold that will be the strongest force. It is equivalent to pouring water over a campfire to quench the flames. When the hot coals have gone cold - it's all over. Sorry if I seem to be lecturing. For anyone who unfortunately read this far down, the proposed Heat Death of the universe should be taken to mean something like the death of heat as in it gets cold and dark; not death by heat as many who adopt the phrase ad-lib seem to state. Also, unless you can define a constant boundary for the universe and can offer a proof, the universe itself is considered to be an open system. This makes an analogy to a closed system, a combustion engine for example, very confusing or purposely misleading. When you say that "several means by which electromagnetic energy can be transformed to Mass", surely you don't mean that EM energy can be transformed INTO mass. ......this is EXACTLY what I'm saying. It can be OBSERVED & MEASURED. One means by which this is observed is via Electron Pair Production where the energy of a gamma frequency photon can be converted into an electron-positron pair. How many other ways energy is transformed to mass is a huge unknown, but it must be significant or the Universe would have been dealt a heat death blow long before now. the proposed Heat Death of the universe should be taken to mean something like the death of heat as in it gets cold and dark; not death by heat as many who adopt the phrase ad-lib seem to state. unless you can define a constant boundary for the universe and can offer a proof, the universe itself is considered to be an open system. ......no, only by lost souls as yourself is there such a consideration, This because you've never studied the one immutable law of Physics that is the cornerstone of ALL of the Laws of Physics, ENTROPY, the 2nd Law of Thermodynamics. This makes an analogy to a closed system, a combustion engine for example, very confusing or purposely misleading. .......because real science is so far over your head that among educated people who send rockets all over the solar system you are absent from reality. I know for a fact that Mass can be transformed into Energy, such as the nuclear bombs used as weapons and for testing. And in nuclear power plants such as Chernobyl and Fukushima and other places. The Energy is within the Mass and a chain reaction and temperatures build up until either fission or fusion (as in the case of Stars) is produced. But I have never heard of Energy being transformed INTO Matter/Mass. That is Transmutation which clearly amounts to Magick. And life can only come from life, it can't come from Nothing. Both have been tried many times by scientists, but the attempts always fail. There is a secret to the process - and nobody is talking. So, it is possible to change Mass into Energy, but not the other way around. When you are referring to particles transforming into other kinds of particles, that is not Energy transforming into Matter, even though Matter is composed of Quantum particles. And particles have their own energy built-in. What in the world do you mean by "death of heat"??? Heat is not alive, it is temperature and that's all it is. When there is no more fuel to fire it up, then the flames get smaller until whatever heat is left gets overcome by the cold. At present, no matter how far we look with our technology, we cannot see the end of the Universe. But that doesn't mean that there is no boundary where everything is enclosed in. How can you misunderstand something so simple? If you are truly incapable of comprehending something so simple you have absolutely no chance of understanding any article on this site. Benni, you don't even have a clue what any of the words you capitalized means. How do you manage to write a sentence using mostly words you don't know the meaning of? I don't know, it's a mystery to me, but it sure does not stop you. I almost feel embarrassed for you. Just like Fritz Zwicky once surmised at Cal Tech when he used to teach his students that rockets wouldn't work beyond the Earth's atmosphere because he thought ENTROPY was EARTHBOUND. Hey, old man Ojo, you trying to resusitate old worn out Zwicky theories? How about you proving that the 2nd Law of Thermodynamics is Earthbound. Ojorf is either just another one of SpookyOtto's or Captain Chickenshit's sox, or he/she/it is a hanger-on who reads comments and lives only to make accusations. Obviously nothing more. Ojorf only seems to appear when one or both of them are in a forum - and behaves like an acolyte of either one, or both. It is best to ignore that one. I repeat: "One means by which this is observed is via Electron Pair Production where the energy of a gamma frequency photon can be converted into an electron-positron pair. How many other ways energy is transformed to mass is a huge unknown, but it must be significant or the Universe would have been dealt a heat death blow long before now." And life can only come from life, it can't come from Nothing. Life begetting life has nothing to with the inversion states of mass & energy. There is no inversion state of life, but there is an Equivalence Principle of mass & energy transformation whereby the two states can repeatedly be changed from one to the other. I don't distinguish between the two states of MASS/ENERGY following the Equivalence Principle of Special Relativity. An analogy of what I mean: steam/ice energy/mass.....different states of exactly the same thing. Yes, steam and ice are convertible one to the other, only because they are basically the same Mass (water) in transformation between two end products according to certain conditions of temperatures. The only difference is that steam is the result of particles having been in extreme motion caused by an outside force that creates heat - where particles in ice (while still somewhat in motion) is far less in that state of motion. What I was actually referring to is the CREATION of Mass FROM Energy, which cannot be done, although scientists are trying to learn the secret. The opposite is true, that Energy can be created FROM Mass, which is how Fusion in Stars is made possible as an end product. However, the creation of Matter/Mass FROM Energy requires a Transmutation which has only been done once before, in the history of the Universe. Consider a tree on a hill, where a lightning strike kills the tree, burns and topples it. It is still a tree but no longer living. The tree represents Mass transforming into Energy - because it burns. Now, consider a bolt of lightning that CREATES a tree where there was no tree there before. THAT is the transmutation of Energy into Matter, and it has been done but once, and ONLY once. There are some who would call it "Magick", and it would seem so. But there IS a probable formula to it - something which I am not allowed to discuss. So, there is Transformation, and there is Transmutation. Oh, I almost forgot - that a Transmutation has occurred at least one other time in the past 10,000 Earth years. You are obviously clueless about literally everything. You must be the poster with the best track record for getting everything you write wrong in some way or another. Astounding! Unless you are faking it, you must be the most confused person ever, misunderstanding almost everything you experience. How does that feel? TRANSMUTATION is more specifically related to changing the chemical characteristics of one kind of mass to another kind of mass, alchemy. It has not "been done but once", it's going on all over the Universe presently, if it were not an ongoing process the Universe would have reached UNITY ENTROPY a long time ago. Darkmatter; a rut of our own making, to prove an observation we know the answer lies not in darkmatter! Take the galactic rotation, 2 stars in 7Lyr orbital's take 250million years to complete 1 orbital and it is no coincidence the galaxy rotates the same, in 250million years, as the galaxies rotate at the average separation of 7Lyr binary orbitals as all galaxies irrespective of size have the same rotation period, so as we continue to search the vacuum for this allusive matter that is dark to explain galactic rotation as darkmatter cannot be found and used to explain galactic rotation, the stars in 7Lyr orbital's take 250million years to complete 1 orbital where all the galaxies rotate the same, in 250million years! Possible eureka moment – it's flexions. Two basic kinds them: open or closed. Dark matter is the latter. Regular matter is the former. Flexions are tiny bits of maximally curved spacetime (more specifically, the fields which permeate spacetime, e.g., electromagnetic, gravitational, etc.). Flexions prevent singularities from occurring. Flexions occur from overlapping vertices of octonion and/or quaternion geometrical symmetries. Flexions are flat in the absence of energy, so the maximally curved closed ones retain their energy of formation (like a compressed spring) but the energy that formed them tunnels out. The closed flexions remain closed in curved spacetime, but when in flat spacetime they release their energy of formation and reintegrate, resulting in local expansion of spacetime, i.e. dark energy. … the energy of formation for the open flexions is much less than for the closed ones because the local curvature is sufficient only for a fraction of the vertices to overlap. When vertices overlap (due to extreme curvature from local energy densities) they disconnect from adjacent regions of spacetime and connect to themselves, forming sort of a bubble of spacetime that's no longer directly connected to the surrounding bulk. The open flexions have "loose ends" or "exposed edges" which interact with fields in the bulk and with other open flexions. Three basic kinds of them: positively charged, negatively charged, and neutral. Most of the energy of formation tunnels out, but not all, giving three generations of regular matter.